Increased recognition of emotional challenges and targeted therapy to address them are helping social workers improve outcomes. For practitioners who want to help ease the burdens associated with chronic illness, nephrology social work is an evolving field that offers great opportunity to improve patient outcomes and make a significant difference in the lives of individuals who face multiple challenges. “Social workers in end-stage renal disease [ESRD] settings are important members of the interdisciplinary treatment team because they take a person-centered approach to helping patients meet their fullest potential socially, vocationally, emotionally, and physically,” says Tiffany Washington, PhD, MSW, an assistant professor at the University of Georgia School of Social Work. Among social workers’ responsibilities are counseling, education, case management, and crisis intervention, she says, while day-to-day tasks may include helping patients understand treatment options, locate and access community resources, and solve adherence challenges. Equally important is the social worker’s role as an advocate for policy and reforms to meet patients’ needs, she adds. Increasingly, however, the nephrology social worker’s role has shifted to focus more on providing clinical interventions for emotional issues that if unaddressed may erode or impede patient adherence and improvement. It’s an approach that’s validated by the Centers for Medicare & Medicaid Services (CMS), which mandates the presence of an MSW-level social worker in all dialysis clinics to help address these emotional obstacles, as well as by leading providers of dialysis services, such as DaVita and Fresenius Medical Care, which view targeted therapy for psychosocial issues arising from dialysis as a standard of care. ESRD, most often caused by diabetes or high blood pressure, is the ultimate point in chronic kidney disease when the kidneys cannot filter waste and excess fluid from the body. Dialysis mechanically removes waste when the body is no longer able to do so. With hemodialysis, the blood travels through a tube and is filtered by an artificial kidney, while in peritoneal dialysis, a solution is introduced into the abdomen through a catheter and is later removed. In-center hemodialysis is done three times per week in a clinic setting, while peritoneal dialysis and home hemodialysis can be done at a time and a location chosen by the patient. Furthermore, Merighi says, patients may experience emotional repercussions due to treatment-related fatigue, the need to rearrange their lives to accommodate treatment, and potential concerns about body image. For example, they may be concerned about the arteriovenous fistula, the access point for dialysis needles, which is not only noticeable to others but is also an ever-present reminder to patients of the ways in which dialysis is a part of their lives. And if it’s daunting for adults, it’s even more difficult for children. Beth Bounds, LCSW-C, a patient care advocate and clinical social worker at Johns Hopkins Children Center, and Barbara Case, RN, a pediatric nephrology nurse at the center, work together to help children and their families cope with treatment. “There’s a sense of loss from having to change and adjust their lifestyles, missing activities—being unable to have sleepovers with friends, for example—or for having to be hospitalized if they’re medically unstable,” Bounds says. Loss and depression, she says, are common. Furthermore, having to learn about the equipment and treatment protocol creates a great deal of anxiety, she says. Particularly challenging, Washington says, is the suddenness with which many are forced to absorb all these challenges. “Early identification of kidney disease doesn’t occur as often as we would hope, and many patients learn of their diagnoses after becoming ill and seeking medical attention.” Too many are diagnosed in the hospital, she says. “It’s not uncommon to hear patients express feelings of fear, uncertainty, and anxiety, particularly when dialysis is an immediate need,” she says, observing that patients have much to learn and many decisions to make all at once. All these things together “can take a toll on a person’s emotional well-being because they represent limits and losses associated with having a life-threatening chronic condition,” Merighi says. Addressing these issues isn’t only crucial to improve patients’ emotional health but also their physical health. All of these feelings affect quality of life, which in turn influences how individuals feel physically, the extent to which they can maintain independence, engage in activities that are meaningful, and be at ease in terms of body image, according to Merighi. Some patients “are resilient and develop adaptive coping strategies to manage life in light of living with ESRD,” Washington says. But research suggests that roughly one-fourth of individuals being treated by dialysis are depressed, which “can undermine important ESRD self-management tasks,” she adds. For example, in Washington’s own research (publication forthcoming), depression in patients aged 50 and older was negatively associated with fluid adherence, which can result in poor outcomes, including congestive heart failure. Depression and poor quality of life “contribute significantly to poor health outcomes for hemodialysis patients,” Merighi says. They affect the patient’s ability to adhere to difficult treatment schedules, rigid dietary restrictions, and strict medication regimens. Quality of life, says Merighi, is negatively associated with hospitalization and mortality rates. Treating depression in the hemodialysis population “is critical because it is associated with other suboptimal patient outcomes such as poor oral medication adherence, poor patient nutritional status, and poor appetite.” And depressed patients, he adds, are less likely to be physically active or to continue employment after starting dialysis, further eroding physical and emotional well-being. Depression may occur not only in response to the emotional challenges of facing dialysis, but also from psychological or physiological factors associated with kidney disease, Merighi says. Diagnosing depression, he adds, can be difficult because multiple assessments may be required to uncover the cause. Depression also can be eclipsed by other mental health conditions, making it hard to identify, Washington says. That’s of particular concern with older patients who may be experiencing normal physiological changes associated with aging, she explains. The most commonly used tool to assess depression is the Kidney Disease Quality of Life (KDQOL) survey, which is required by the CMS to be administered to dialysis patients in ESRD facilities within a few months after treatment begins and a minimum of once per year afterward. Washington says the KDQOL “is widely used among nephrology social workers to assess patients’ mental and physical functioning and the burden of ESRD. It’s a useful complement to their existing psychosocial assessments that evaluate psychosocial concerns, including current or previous experiences with depression.” Social workers, she says, may choose to embed existing, reliable depression screening tools into their psychosocial assessment forms. According to Washington, social workers continue to use evidence-based clinical approaches, such as cognitive behavioral therapy, to address depression in ESRD patients, and at times may refer patients to community-based agencies for long-term counseling. But, she and Merighi agree that a new approach is making an impact on dialysis patients and the manner in which they’re treated. While cognitive behavioral therapy is among the most popular talk therapies used in depression treatment, it has its limitations when used to treat dialysis patients. A new approach, symptom-targeted intervention (STI), developed by Melissa McCool, LCSW, a consultant with DaVita and the founder of STI Innovations, has made a notable impact and is now widely used in major dialysis treatment facilities. Merighi describes STI as a novel clinical approach to treat depression and improve quality of life in hemodialysis patients. He says STI “is an innovative, brief, and patient-centered approach that modifies cognitive, behavioral, and mindfulness techniques to make them user-friendly for patients and brief in their delivery.” The technique “was designed with fast-paced medical environments in mind and combines elements of cognitive, behavioral, and mindfulness clinical approaches to addressing depressions,” Washington adds. McCool developed STI after experiencing repeated frustrations when she began working in nephrology and noticed that the patients she referred to outpatient psychotherapy would not go. The need to address their depression was clear; therefore McCool taught herself cognitive behavioral therapy, which she knew to be the most evidence-based approach to treating depression, and started using it along with mindfulness techniques with her patients. She quickly found that the therapy, while effective elsewhere, wasn’t a good fit for patients in the medical setting. It took too long, and her overwhelmed patients needed immediate help. She began talking to patients to see if she could find a way to make an impact. Recognizing depression as a cluster of interconnected symptoms, she honed in on individual aspects. “I said to patients, ‘pick out one symptom from among your problems and we’ll focus on it.’ If a patient was troubled by insomnia, rumination, and anxiety, for example, I’d ask her to pick the most bothersome symptom, and we would focus on that symptom. My thinking was that we would work on one symptom and then gradually get to the others.” Her guiding principle was the notion that something is better than nothing; she didn’t realize she was onto something that would be effective. But when she focused on one problem and the targeted symptom got better, all the other symptoms improved as well. There is a domino effect. 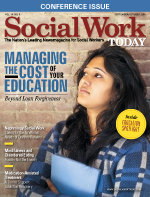 “When the social worker focuses on one symptom or problem, the patient and social worker both feel less overwhelmed by the multitude of problems. This also ensures that the sessions are less than 20 minutes long since medical social workers have many other responsibilities and don’t have a lot of time,” she says. McCool’s experiment led to the founding of STI in 2009. When she shared her approach with Stephanie Johnstone, LCSW, the regional lead social worker at Fresenius Medial Care North American, Johnstone encouraged her to write up her approach. They worked together and created the first STI training video. Johnstone, along with other social work leaders, designed a pilot program in 2011 involving 46 social workers who read the manual, viewed the video, and began applying the approach with patients. The results of the pilot were dramatic: After spending only 11/2 hours with patients over a six-week period using the intervention, patients’ quality of life scores increased significantly. McCool began selling an expanded version of the training manual and the video online, and the intervention “took off organically,” she says. Today it’s used by the leading dialysis providers and has become the standard of care. “Nephrology social work practice is an exciting and rewarding career,” says Joseph R. Merighi, PhD, MSW, an associate professor at the University of Minnesota School of Social Work. Melissa McCool, LCSW, a consultant with DaVita and the founder of STI Innovations, sees a need and increasing demand for well-trained clinical social workers in dialysis facilities, and Beth Bounds, LCSW-C, a patient care advocate and clinical social worker at Johns Hopkins Children Center, adds that they are needed in research, policy, and advocacy as well. The Centers for Medicare & Medicaid Services’ Conditions of Coverage for End-Stage Renal Disease Facilities mandate that social workers in these programs hold an MSW from a Council on Social Work Education–accredited program, says Tiffany Washington, PhD, MSW, an assistant professor at the University of Georgia School of Social Work. In addition, social workers can prepare for work in nephrology by gaining an understanding of the prevalence of chronic kidney disease, recognizing the populations who are disproportionately affected, and becoming familiar with the ways in which chronic renal disease affects the well-being of individuals and family systems, she says. Merighi and Washington stress the need for practical experience. Washington urges social work students to consider field placement options in medical settings in general or hemodialysis in particular and encourages them to take advantage of advanced clinical practice, medical social work, and geriatric coursework. “I strongly recommend reaching out to a social worker at a nearby dialysis facility so you can learn firsthand the ways in which social workers make a difference in the lives of people with kidney disease,” Merighi says. Knowledge about the person-in-environment perspective is ideal, says Washington, who also points to the need for special knowledge and skills to serve an aging and increasingly diverse population, including those pertaining to age- and culturally appropriate clinical and behavioral interventions as well as caregiving and end-of-life issues. “Learn about kidney disease by going online to the National Kidney Foundation [http://www.kidney.org] and find out what nephrology social workers are doing at the national level through the Council of Nephrology Social Workers [CNSW] [http://www.kidney.org/professionals/CNSW/index.cfm],” Merighi says. Bounds adds that the foundation’s clinical conference meetings are valuable. “There’s a large social work network and a focus track for pediatrics,” she says. “Contact your local CNSW affiliate chapter and get connected,” Merighi says. Social workers wanting more information about the concepts and practices of symptom-targeted intervention used in dialysis facilities across the nation can visit www.stiinnovations.com.